As our society becomes increasingly more health conscious, participation in both competitive and recreational sports activities continues to see unprecedented growth. Consequently, there is a continued rise in the prevalence of sports overuse injuries. 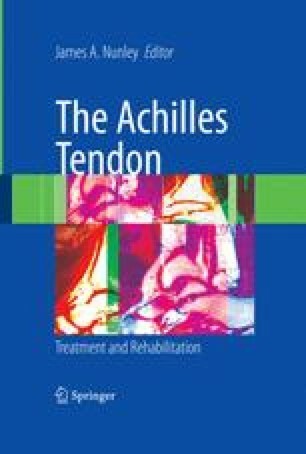 Tendon injuries account for 30% to 50% of all injures related to sports, and Achilles tendon disorders account for a substantial proportion of these injuries.1 Achilles injuries occur annually in 7% to 9% of athletes participating in running, basketball, volleyball, and squash.2,3 The physicians treating these athletes must have a sound understanding of noninsertional Achilles pathology to minimize morbidity and enable patients to return to their desired level of activity in a timely manner without residual or recurrent pain. This chapter focuses on the terminology, relevant anatomy, epidemiology, and pathophysiology that provide a foundation for proper diagnosis and treatment of noninsertional Achilles tendinopathy.